Lillie Buck Harris obituary. Carnes Funeral Home. 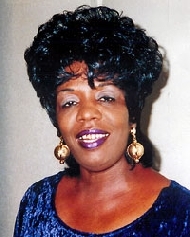 Lillie Buck Harris, 69, passed away on January 2, 2015 at Memorial Hermann Southeast Hospital in Houston, Texas. Born on October 15, 1945 in Lafayette, Louisiana she was the daughter of Josephine H. and Jim Buck. Prior to her long term illness, she was an active member of Blue Ridge Baptist Church. She enjoyed church, community services, and working with outreach programs.She had an enduring personal characteristic that cared for people, sense of humor, peace maker, and quick wit. Her ability to work for changes and supporting communities was related to positive changes for serious community issues. She will be well known as a mother, sister, grandmother, friend, and community activist. She is survived by Daughter, Cheryl M. Carter; Sons, Albert J. Buck and his wife Phyllis S. Buck, Antonio X. Buck; Sisters, Verna Bledsoe, Janie B. Young, Helen Taylor and Emma Buck; Brother, Willie Siverand; 8 Grandchildren, 8 Great Grandchildren and a host of Nieces and Nephews. She will be greatly missed. She was predeceased by her Parents, Josephine H. Buck, Jim Buck; Sisters, Evelina Trotter, Mary L. Jones; Brother, James J. Buck. The viewing will be held on Saturday, January 10th, 2015 at 10:00 a.m. at Galilee Missionary Baptist Church. The Funeral Service will be held on Saturday, January 10th, 2015 at 11:00 a.m. at Galilee Missionary Baptist Church, 6609 Fairwood Road, Hitchcock, Texas, 77563. Interment at Hayes Grace Memorial Park Cemetery.